Everyone knew it was coming…we just didn’t know exactly when. A little over a week ago, the Golden State Warriors scored 92 points in the first half in a 149-124 victory over the Chicago Bulls. However, the story of the night was a Golden State Warrior setting a new NBA record. Golden State Warriors Klay Thompson set the new NBA mark with 14 made 3-pointers, breaking his teammate Steph Curry’s record of 13. What’s more is that he did in just 27 minutes and did not play the 4th quarter. Thompson went 18-29, 14-24 from 3, and 2-2 from the free throw line to finish with 52 points. If that wasn’t amazing enough, Thompson also managed to score 52 points on just 12 dribbles! Yes, that’s right, 12 dribbles! This isn’t the first time Warriors Klay Thompson has had an insane scoring output. Just over 2 years ago, he had a 60-point game versus the Indiana Pacers. He managed to do that in just 29 minutes (also didn’t the 4th quarter in that game) only utilizing 11 dribbles and possessing the ball for a total of 90 seconds. To put his 12-dribble, 52-point effort in perspective and how rare that is in today’s game, we just need to take a look at Derrick Rose’s monster game just this past week. Rose, who has gone through a lot the last several years, scored 50 points against the Utah Jazz. Rose only hit 4 3’s compared to Klay’s 14. He also took a league-high 653 dribbles in the game to do it, while Warriors Klay Thompson only took 56 dribbles in the entire game. There is no doubt there are many different ways of scoring the basketball. These two performances are perfect examples of that. 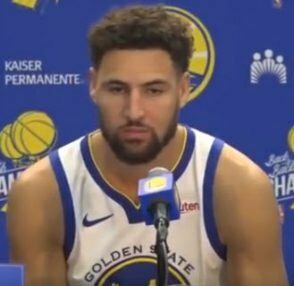 The unique thing about Klay’s performance is that it is not the basketball norm in the modern game. So much of the game revolves around the dribble and making plays off the bounce. While there is certainly more of an emphasis on ball movement, spacing, and taking 3’s…catch and shoot on the move is still a rare art in today’s game. Catch and shoot off screens is even rarer as it requires the unselfishness of teammates to be willing screeners.